We’ve just come across a brilliant GIF of how the iPad has evolved since its release in 2010. 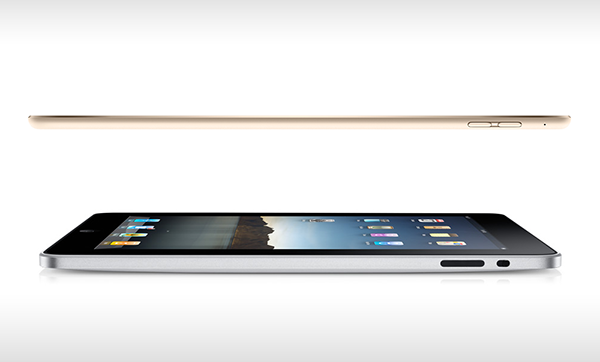 Fans across the world cannot help but marvel at how slim the iPad Air 2 actually is at 6.1mm, considering the firepower it carries in that sleek shell. The animation is not something ground-breaking in itself, but gives the viewer a pretty slick recap into the evolution of the iPad. Apple has come a long way with its tablets in four years span, and this animation actually allows you to process that fact in a few seconds. The iPad Air 2’s secret to this sleek silhouette is the Optically Bonded LCD, glass and touch sensor, and it even manages to beat how slim the iPhone is at 6.9mm. Apple has continued to make the iPad lighter with every new model, making sure that the tablets can truly fit into the portable list of devices. We know, a lot of users have replaced their laptops, in favor of newer iPads. Where the iPad Air model seems to have really jumped up a generation, the iPad mini seems to be still starting out, and not much has changed as far as dimensions are concerned. Sadly, that holds true for what’s under that hood as well, and fans will love to see the iPad mini finally be more than just a shorter version of its larger sibling. The animation here, does not touch upon that rather soar subject for Apple right now, however if the Apple design team sees this animation, it would be pretty impressed with itself. Earlier, the team that just released this animation of the iPad’s evolution, brought forth the same for the iPhone as well, showcasing a truly awe-inspiring transformation of the smartphone industry’s hottest selling device. How cool is this animation? Let us know what you think in the comments section below! Is this supposed to make us buy a new iPad? DID APPLE CREATE THIS PRESS RELEASE FOR YOU TO BLOG OUT? How much are Apple paying you? Bro, incase you dont see.. Having the thinnest tablet is inovative in itself. But they also improved most of the internal specs to… Show me a tablet thinner and faster and ill shut up.